Yes! I have returned. After a month. November was wild. The first half of the month was consumed with being sick, NaNo-ing, and packing. The second half was driving from Texas to Utah(a very long drive let me assure you), visiting family and friends, finding out that my dad's cousin is also a writer and getting to read her first chapter, and having almost no wifi for two weeks. That last part was not so fun. But I'm back now, and I'm all ready to tell you about what happened with NaNo by linking up with Cait and Sky's Beautiful Books meme. 1. On a scale of 1 (worst) to 10 (best), how did the book turn out? Did anything defy your expectations? Word count wise, it was awful. I got 11k instead of my goal of 25k. So that was lame. I got to write some freaking awesome scenes that I've been wanting to write for foreverrrr. Including, but not limited to: kissing, almost-kissing, backstory revealing, and risking your life to save your friend. THIS IS ACTUALLY REALLY HARD, GUYS. I've been thinking about it for dayyyssss and can't really think of anything specific. Just, any generic fantasy story meets a generic coming-of-age YA story. That makes it sound way lame but I swear it's not. 3. Do you enjoy working with deadlines and pressure (aka NaNoWriMo)? Or do you prefer to write-as-you’re-inspired? Give me alllll the deadlines, precious. I really like the tracking-my-progress part of NaNo too. Which is why I use myWriteClub during the non-NaNo months. If I just wrote whenever I felt like it...I would never get anything done. 4. How do you go about editing? Give us an insight into your editing process. When I find out, I'll tell you. I've actually....never made it to the editing part? But I'm getting there, which is terrifyingly exciting. I do have a plan though. 5. What aspect of your story needs the most work? Also me. All three expressions. Me. Lots of things. All the things. It's my first book ever; what do you expect? To be honest, though, the characters and storyworld really need to be fleshed out more, and I need more character development. I have most of a plot (read: most), so I'm pretty good on that aspect. But all in all I'm terrified excited to fix this. 6. What aspect of your story did you love the most? The fact that it exists? The fact that people like it? The fact that I'm 71% done? Okay but in all honesty, I think I love my characters most. Because in the end, that's what matters most. If someone loves the plot but hates the characters, they probably won't like the book. True, a lame plot can't really hold awesome characters, but to me, characters are the most important part of a book. 7. Give us a brief run down on your main characters and how you think they turned out. Do you think they’ll need changes in edits? Speaking of characters. Ah, my babies. I can never talk about them enough. I apologize in advance for the length of this section. First off, we have Kaleth. Pretty boy, courageous, protective, strong Kaleth. I struggle with writing him a lot, despite my love for him. I want him to come across as a strong, fearless, calculating leader, but in my efforts to make him seem like that, he became....one-dimensional. And, with help from some awesome friends(looking at you, Emily and Sierra! ), I'm realizing that I need to stop panicking. He's barely seventeen! He's human! Let him write himself! Leaders can still have fun and joke around with their friends! Especially when they're teenagers! And then there's Barrow(who does not look or dress quite like this gif, but it's adorable and something he'd do and I wanted to use a gif). He's a player, a flirt, and an obnoxious jerk. But oh how I love him. He's gone through hell, and hasn't quite come out of it, but he's getting there(with help from *cough*certain people*cough*). He's got issues. He's destructive, and caring, and annoying, and brave. He's a jumbled mess, and I'm really proud of how he's come through in this draft. I just need to make his friendships/crushes more gradual and less out of the blue. Why do I only have one gif for her. I need to fix this. Ah, Danica. My lovely precious child. She's brilliant but doesn't believe it, beautiful but can't see it. She's incredibly smart, caring, and gentle. She came across as a bit of a pushover in the beginning, instead of just shy like I'd intended, so I need to fix that. I'm also sad her genius didn't make its appearance as much as I'd want it to(mostly due to my fear/hate of writing planning meetings). 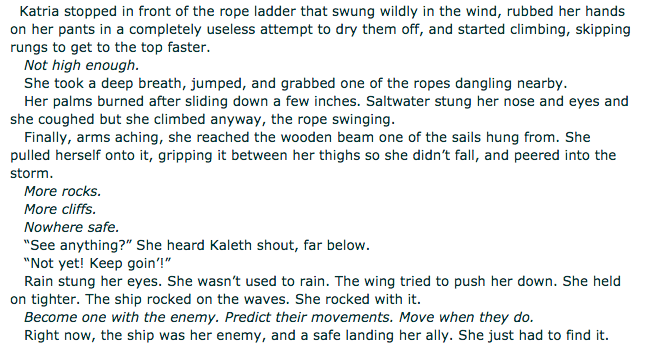 I'm still struggling to figure out how exactly to write her POV, but all in all she did quite well in this first draft. Allorie is Cinderella. Seriously. She's had a super sucky life(sorry darling), has a nasty mother, is forced to live and work wayyyy below her station, but through it all, she's still one of the kindest, sweetest, most selfless people ever. "Have courage and be kind" is pretty much her life motto. I understand her really well...in theory. When I'm not writing. I haven't quite found her voice, or how she works, but I'm getting there. I love the child to bits, though. This is Katria. Sort of. She doesn't dress or look quite like this, but it shows you how gloriously kickbutt the girl is. She's violent, sarcastic, anti-social, and easily angered. She's a quick thinker and loves a thrill. She's in love with her childhood best friend, but no one(not even she) knows it. Somehow, despite the fact that she's almost my complete opposite...she's one of the easiest to write. It's weird. But I love it. I love her sass, her knife obsession, and the way she thinks about said best friend all the time(resulting in me screeching "WOULD YOU HURRY UP AND FIGURE IT OUT AND JUST KISS HIM ALREADY" despite the fact that they're hundreds of miles apart). She did really well this draft. And last but not least is Egin. He is a "Beautiful Cinnamon Roll Too Good For This World, Too Pure". Literally. He's got asthma and really bad social anxiety. He can do a little magic, mostly just making pretty things to calm him down when he has panic attacks. He loves his family, especially his little sister, who he'd do anything for. But...he came across as really really really whiny. He's only had a few chapters but he has a panic attack in each one. Yeah, he's not as brave now as he will be in later books, but I don't want him to seem like an obnoxious wimp. And the traditional writing structure kinda goes out the window when I'm writing from his POV, and I'm afraid that'll annoy people. So, Egin as a character is perfect. The way I write him is not. 8. What are your plans for this novel once you finish editing? More edits? Finding beta readers? Querying? Self-publishing? Hiding it in a dark hole forever? Edits! All the edits! I wanna get this baby published eventually(in which case I might actually cry). 9. Share a favourite snippet! Oh boy. I shall attempt to find something not full of spoilers. 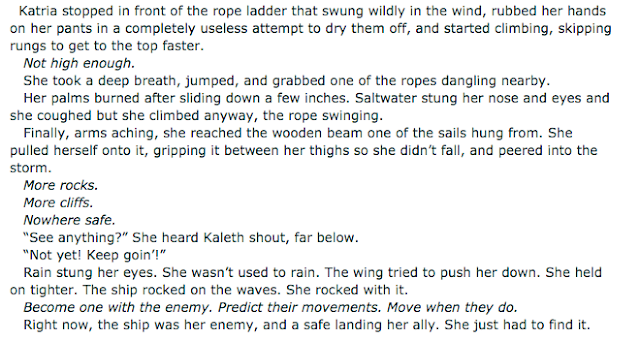 I got to write an entire chapter of her daring stunts. It was glorious. 10. What are your writing goals and plans for 2016? Originally, my plan was to finish the first draft of Children of the Nameless before the end of 2015, but I don't think that's going to happen. Sadly. I want to finish it as soon as possible, and then get started on edits before I start writing the second book at the end of next year. Someone hold me I can't believe this is happening. So there you have it! A basic rundown of my November. I am so ready for Christmas break(which will hopefully translate to "lots of writing time"). Did you do NaNoWriMo? How did it go? Are you excited for the holidays? BUT ONCE AGAIN YOU'RE WAY TOO HARD ON YOURSELF WITH EVERYTHING. 11K IS AWESOME. THE CHARACTERS ARE AWESOME. YOUR WRITING IS AWESOME. IT'S ALL AWESOME, OKAY? You got progress and that's what counts. ^ ^ I really like your character names! Wishing you the best with your writing goals you can do it! Thanks so much! ^_^ I'm glad your NaNo went well too!